In 1994 I started working on Snake Brands' snake guides. I knew that weight affected even the best designed rods and with this in mind I introduced our original design. It was at this time I determined that each guide should have its own wire diameter to compliment its placement on the rod blank, this was an Industry First. I had always wanted to offer to our valued customers a complete offering of components from the tip top to the snake guides to the winding check and hook keeper and now the reel seat that could be color matched. 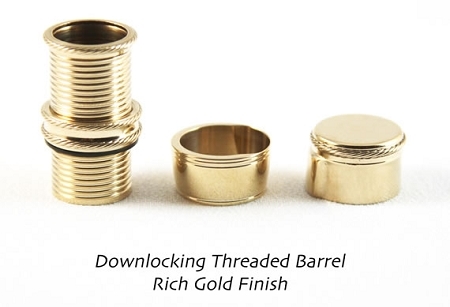 Downlocking slide band with mortised foot 3.465" .687" .375"
Uplocking threaded barrel with round insert 3.465" .640" .420"
Uplocking threaded barrel with round insert 3.500" .705" .420"
The burl is similar to maple but has tighter eye patterns. It comes in a rich coffee color in the heart wood and creamy white tones in the sapwood. I am eager to dye some of this wood in the near future. Buckeye is unique with its marbleized patterns and beautiful eyes. The color tones range from spectacular yellows to blue-grey tones to yellows with black and solid creamy yellow. Our dyed buckeye is just stunning. Because of minerals in the soil this burl when dyed can yield green tones and swirled marble plum tones with hints of black. The finished inserts have an almost translucent quality. Some of the finest shotguns ever made feature this wood. Having spent time cutting into trunks of trees searching for the pieces with swirls that are highly figured pieces I can state that almost all of the good trees have been cut for their burls which are sent to Spain to be peeled for high end veneers. We will be able to offer these pieces for a short time as most of the really good trees have been cut in the last twenty years. 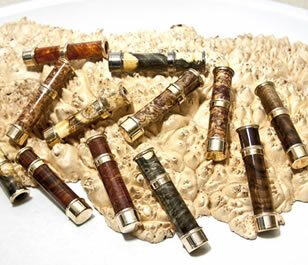 We offer highly figured maple burl, spalted maple and dyed maple. Maple burl when dyed features beautiful eye patterns with a plum coloration throughout the figuring. This is an amazing wood, it yields reddish brown tones with dark eyes. 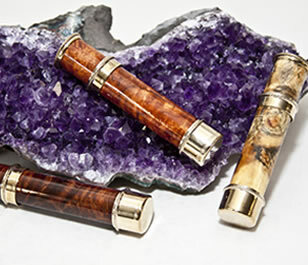 I first saw this wood in custom knife handles and I knew that I must find this wood to offer it to our valued customers. I later found the Flamed Redwood, it has rich warm tones coupled with the beautiful golden banding that picks up light in every direction is truly unique. When I look at the first rod that I built my only regret is that I wished someone could have offered me wood of this quality. 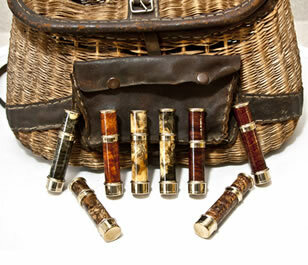 A Custom Built Fly Rod Deserves Only The Finest Components Available. I am confident that you folks can take this and run with it.